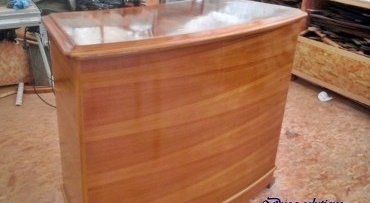 Quality exterior yacht deck furniture makes luxury design complete. Teak wooden yacht table (folding or not), chairs, sunbed, sofas, flaps, bars and bar stools next to a stunning jacuzzi lined with teak will create a miracle on your Sundeck! 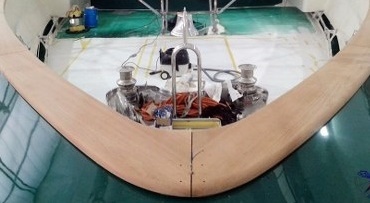 DUCA Solutions' highly experienced yacht carpenters can produce a wide range of custom quality exterior yacht deck furniture with or without varnish, including boat handrails and cap rails, laminates, molding, capping rails with scarf in teak or mahogany. 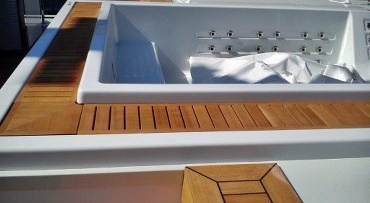 Teak around Jacuzzi hot tubs on super yachts is an extremely popular element among yacht owners, captains and designers. 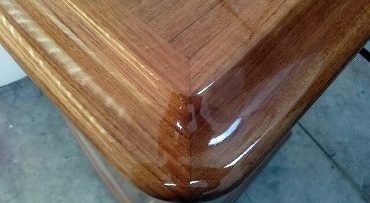 DUCA Solutions will line your custom jacuzzi tub or swimming pool up with teak in any model you like. 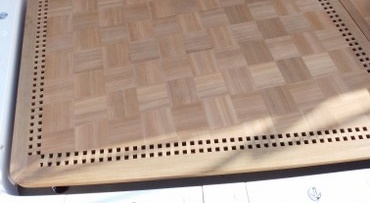 Thanks to completely automated CNC production, we can supply all kinds of shower grids and gratings in teak for superyachts in no time.